Evergreen Baptist Church in Rosemead, California was Iwa’s first long-term church partner. Founded in 1925 by Japanese immigrants, it became one of the largest and fastest growing Asian American churches in the U.S., when from the late ‘70s through the ‘80s, its attendance grew from less than 50 to close to 900. Associate Pastor Ken Fong was a member of Iwa’s initial Board of Directors, and his wife, Sharon Uyeda Fong, was a founding Iwa staff member. Other staff at Iwa worked informally with the Evergreen leadership from 1981. Evergreen hired Arlene as a full-time pastor in 1992, and thereby acquired its own in-house Iwa staff. While on staff at Evergreen, she continued her involvement with Iwa as an Associate. No longer on staff at Evergreen, she continues to serve as an Iwa Associate. In 1997, for the purpose of greater growth and outreach, Evergreen divided into two separate churches: Evergreen Baptist Church of Los Angeles, and Evergreen Baptist Church of San Gabriel Valley. Both are continuing to thrive and grow. Iwa made a major contribution to the development of ministry sources for Japanese- and Asian Americans by producing its own publication called the kaki seed. With the subtitle, Developments in evangelism and ministry to Japanese people worldwide, the kaki seed documented the new insights that Iwa was discovering in its first few years. Under the experienced direction of former McGraw-Hill Book Co. editor Arlene Inouye, the staff took on the monumental task of publishing this 12-page journal without the help of computers and desktop-publishing capabilities, and managed to assemble 8 issues: three in 1984, three in 1985, and two in 1987. Amazingly, many of the articles are still relevant today. All of them can now be read on, or printed from, Iwa’s website on the kaki seed page under Resources (go here). In the first issue, Stan Inouye explained how the publication got its name: "For those of you who are unfamiliar with the word 'kaki' it is the Japanese name for persimmon. The fruit of the kaki tree, long after the leaves have fallen, tenaciously cling to their branches in the harshest of fall weather, symbolizing perseverance and long life to the Japanese. Because of this meaning, we have selected kaki to represent the kind of fruit we want to produce—Japanese people who become persevering and committed Christians. Some kaki contain seeds and others do not. Seeds determine whether a kaki has the infinite potential to multiply itself. The content of the kaki seed focuses both on finding ways to bear fruit and the means to enable fruit to produce yet more fruit. Jesus said, 'You did not choose me, but I chose you and appointed you that you should go and bear fruit and that your fruit should abide. . .' (John 15:6)." The kaki seed is a publication that has been regarded as worthy of preservation for future generations, as attested by this e-mail from the UCLA Asian American Studies Center: "Our Center's special research library maintains a large vertical file collection on significant and important Asian American community organizations across the nation. After reviewing some of the materials I have received in the mail, I believe that Iwa's work and contribution to Asian Americans is worthy to note and include in our Organizational collection. So, in order to establish an "institutional legacy", I would like to obtain as complete a set of your "Kaki Seed" newsletter, as well as any other publications that your organization has published." Christian Layman Church in the San Francisco Bay Area was Iwa’s long-term church partner in its second decade. Established in 1922 by Japanese immigrants who wanted a church free from a governing body and run by lay Christians, it became the leading Asian American Christian church in the Bay Area when it grew significantly to a congregation of about 400 under the leadership of Senior Pastor Wayne Ogimachi. When the church was dealing with issues related to breaking the 200-member barrier, Iwa was brought in as a consultant to Wayne and his leadership team in 1992. The story of God’s work through Iwa in Portland, Oregon started in 1990, in Manila where Stan was attending a conference on world evangelization. There he met the owner of a chain of Christian bookstores who offered to fly him to Portland to discuss reaching Japanese there. He also met someone he had met in Kenya who had became the Director of Missions for Western Seminary in Portland, and who also pastored a church which had 20 or so Japanese in the congregation. When Stan happened to be in Portland in 1991 for a leadership conference, he contacted the two he met in Manila and Kenya. Through them, and on four subsequent trips, he met many others who had ministries to the Japanese in Portland. In 1992, while Stan was in Seattle, he was encouraged to go to a housewarming party which many Japanese American Christian leaders were expected to attend. There he met a Sansei woman from Portland who had moved to Seattle for her own “spiritual survival.” Burdened in her heart for the Sansei Christian friends she left behind, she urged Stan to visit them. The next time he was in Portland, he got together with her friends—3 couples. On a Sunday with limited time, Stan worshiped with them in his hotel room, had brunch with them at a seafood restaurant, and talked about church planting. In 1993, Iwa brought together over 40 local and international Christian leaders for a special dinner at Warner Pacific College. They talked about the needs of, ministry to, and vision for the Japanese in Portland. At the end, they were invited to participate in a two-day prayer and visioning retreat. About half responded. Iwa’s retreat resulted in the formation of a network of international leaders to share information and resources, and meet regularly to support each other in their efforts to reach the Japanese in Portland. It became known as Nichibei Christian Fellowship and served for many years as a means of reaching out to Japanese people in the Portland area. Although they didn’t attend the retreat, the local leaders--four couples—pursued a vision for planting a new Japanese American church. Stan advised and encouraged them as they formed Morning Star Bible Church. It became a growing church reaching Japanese- and Asian Americans for Christ. Prayer has always been at the center of Iwa’s ministry. Through prayer we find expression of our dependence on God for accomplishing His vision for reaching the 97% of Japanese Americans and other Asian Americans who don’t yet know him. For two years, from 1996 to 1998, under the leadership of staff member Jo Ann Akada, Iwa held a series of 8 interchurch prayer gatherings in various churches in Southern Cal, and one in Seattle, to encourage our church community to pray for the unreached, to bring together and network those from various churches who have the same desire to pray, and to seek the Lord for spiritual renewal that will inspire our community to reach out to the 97% as never before. The first three prayer gatherings helped to initiate and build a movement of prayer. They had the follow themes: “Pray for the Wave” (Evergreen Baptist, 7/96), “Ignite the Fire” (Anaheim Japanese Free Methodist, 11/96), and “Fan the Flame” (Cerritos Baptist, 4/97). Each of the ones that followed had a special feature.“Soften the Soil” (Union Church, 8/97) included a prayer walk around Little Tokyo during the Nisei Week Festival. “Seeking God’s Face” (First Presbyterian, Altadena, 1/98) put a spotlight on the different generations—Builder, Boomer, and Buster—with a group praying for each one. “Unlocking Hearts for the Kingdom” (Evergreen Baptist of L.A., 5/98) drew over 100 people and featured extended worship led by an interchurch worship team, two testimonies, prayer in groups of three and six, and Life Signs—a report compiled by Iwa of what God was doing in 13 churches and ministries. “Seeing with His Eyes, Praying with His Heart” (Gardena Valley Baptist, 8/98) sent people on a prayer walk around the Gardena neighborhood. “Sowing in Tears, Reaping with Songs of Joy” (San Gabriel Japanese Christian Church, 11/98) featured testimonies by a Nisei woman and a Sansei man about the impact of the World War II internment of Japanese Americans on their lives and faith, and prayer for healing in our community. In Seattle, the “Soften the Soil” concert of prayer (Chinese Baptist Church, 11/97) attracted about 50 participants mainly from six churches. It was the first ever Asian American interchurch prayer gathering in that area. 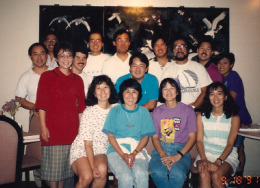 “Coloring Beyond the Lines: Transforming Ministry and Leadership in Our Community” was Iwa’s groundbreaking, first-ever national conference for Japanese- and Asian American Christian leaders in March 1992. Eighty-four attended, including representation from all the major denominations and campus ministries. Most were from California, but others came from Seattle, Chicago, New York, and Georgia. The impact of this conference was enormous. At the time, the senior leadership in the Japanese- and Asian American Christian community was retiring and passing the baton to younger leaders. The challenge facing the new generation of leaders was to determine how they would do ministry differently. So the conference focused on helping emerging leaders understand the nature of change and become positive, sensitive agents of change in each of their situations. "That was one of the best conferences I’d ever been to. Iwa effectively cast the vision for ministry to the Japanese and Asian American community and communicated clearly how important it was to present the gospel of Jesus Christ in ways that were relevant and easily understood by this group of unbelievers." "I learned that I need to be a risk-taker. . .an agent of change. . . . I see that I am addressing an audience which is moved by concrete experience, non-verbal and non-confrontational methods, reflection, and group-oriented approaches. I have greater confidence to break through the walls of tradition and endure in the ministry that God has given me to the end." "I’m impressed by how many people appreciated just getting together with their peers and colleagues—especially when they have never met each other before. It’s so empowering." Executive Director Cyril Nishimoto attributes to “Coloring,” not only some life-changing personal benefits, but also the beginnings of discernment of a career-changing call from God. It led him to leave the social service agency helping Japanese people in need in New York, which he co-founded and directed for over 15 years, and to move back to Los Angeles to take on his current position at Iwa. On December 10, 1983, Iwa held the Walk for the Rock 10K/10 miler around the Rose Bowl to raise funds to produce the first issue of the kaki seed. The original idea was to have 10 people participate, each of whom would obtain 10 sponsors, with the goal of raising $1,000. Amazingly, twenty-five people participated, representing 200 sponsors, raising $3,200. So an annual event was born. Christian community. People perhaps associated Iwa more with running than with evangelism at that time. America, it attracted 100 to 150 participants and raised about $8,000 each year. In 1992, two foundations offered to give grants totaling $15,000 if Iwa could raise $15,000. With this additional incentive to raise more than in years past, the Run for the Rock helped bring in over $13,500 toward the match and enabled Iwa to exceed the $15,000 goal. The Run for the Rock, however, may be remembered by the community more for the collectible T-shirts participants received as souvenirs, than for the race itself. Each year, Stan Sakai, well-known creator of the Usagi Yojimbo comic book series, came up with a special design which was printed on the T-shirts for the runners. The design usually was a cartoon character which had something identifiably Japanese, Christian, and Iwa about it. The T-shirts were so unique and desirable that it is likely many participated in the Run just to get the shirt. See some of his designs here. When Iwa’s new National Board began convening in 1993, it identified a major problem— that few people knew of and understood Iwa’s ministry. One contributing factor was that due to Iwa’s many years of serving the leadership of churches behind the scenes, Iwa had become the community’s “best kept secret.” To put Iwa more in public view, the Board proposed that the “best of Iwa’s insights” be pulled out of the drawers and shared with churches and individuals. So, after testing the material at a young adults retreat in New York, Stan created a series of six workshops presenting the dynamics of Christian living from an Asian American perspective which could reach the person-in-the-pew. provides a very Asian solution to our shame). pray to him, using the Lord’s Prayer as a guide); Home Grown: Living Life the Lord’s Way (how to mature like the well- balanced tree depicted in Psalm One). The first two were taken on the road to Seattle, Portland, the Bay Area, as well as the L.A. area. The Fishing With A Bamboo Pole workshop has been presented widely in different forms over the years. It has even been offered as an 8-week class taught in such churches as Gardena Valley Baptist, Cerritos Baptist, Wintersburg Presbyterian, and Sierra Madre Congregational. Out of the Fast Lane is being developed as a study called “Sabbath Evangelism” and the insights from it have been put into a booklet called “Date with Dad: Quality Time With Our Heavenly Father.” Hearing His Heart has been offered as a seminar on the Lord’s Prayer and has been conducted as a six-week class. Home Grown is still in development.